The modest success of 1985’s independent comedy AFTER HOURS, as well as a detour into episodic television with 1986’s AMAZING STORIES brought director Martin Scorsese back to the attention of Hollywood studio executives following a long rough patch. Scorsese’s career had been flying through severe turbulence since the disappointing reception of 1977’s NEW YORK, NEW YORK, but the surprise success of 1980’s RAGING BULL proved that Scorsese still had untapped brilliance to spare. The same year that Scorsese delivered his AMAZING STORIES episode, he was given another shot at a big time feature, but it wasn’t an original work developed by the director himself. It was a sequel to 1961’s THE HUSTLER, with Hollywood icon Paul Newman attached to reprise his seminal role of Fast Eddie Nelson in a story set a quarter of a century after the original. Titled THE COLOR OF MONEY (1986), the film was written by Richard Price and produced by Irving Axelrad and Barbara De Fina, who saw in Scorsese an unexpected, yet highly inspired match for their material. THE COLOR OF MONEY was moderately successful in its day, and even earned Paul Newman a long-overdue Oscar. Today, it’s a forgotten work within Scorsese’s canon, eclipsed by far greater films. The legacy of the film itself may not be much to sneeze at, but THE COLOR OF MONEY is important nonetheless for giving Scorsese the strong foothold he needed to launch his career’s second act. Set twenty-five years after the events of THE HUSTLER, THE COLOR OF MONEY finds notorious pool shark Fast Eddie Nelson (Newman) living somewhere outside Chicago. He’s long since given up pool, scraping out a meager living hawking knockoff liquor instead—but he’s not removed from the sport entirely. He grooms promising young men with the hopes they’ll become profitable hustlers like he once was, pocketing a share of their earnings in compensation for his mentorship. In a dive bar in a neglected section of town, Eddie encounters a young hotshot pool player named Vincent Lauria (Tom Cruise). Impressed by his raw talent, he encourages Vincent to quit his dead-end sales job and hit the road with him, where he’ll teach him how to be a true hustler. Thus begins something of a road picture, whereby Eddie, Vincent, and Vincent’s girlfriend/manager Carmen (Mary Elizabeth Mastrantonio) drive down towards Atlantic City, taking every hapless sucker for the contents of their wallet every stop along the way. Eddie and Vincent’s partnership is not without conflict, however—one of Eddie’s key strategies is losing on purpose, a skill that Vincent’s pride and stubbornness rails against. Causing further chafe-age is the possibility that Vincent might actually be a better pool player than the aging Eddie—a possibility that will be put to the test when they go head to head against each other during a large pool tournament in Atlantic City. Scorsese’s history of working with star-name actors is somewhat funny, as we tend to think that he’s always done so. It’s easy to forget that Scorsese helped to discover Robert De Niro and turn him into a major Hollywood player. THE COLOR OF MONEY, made nearly twenty years into his filmmaking career, marks Scorsese’s first time working with a true Hollywood superstar in the form of Paul Newman. Newman is highly effective in his reprisal of one of his most iconic roles, Fast Eddie Nelson. His seasoned, autumnal countenance provides countless layers of depth to what could otherwise be a stock “mentor drawn out of retirement” archetype. Newman’s nuanced performance would result in his first win for Best Actor—a win that many in the industry dismissed as a life achievement award rather than recognition of his particular performance in the film. Tom Cruise, who of course is now a Hollywood superstar all his own, was cast by Scorsese right before his national profile soared in the wake of Tony Scott’s TOP GUN that same year. Cruise is a natural fit as Vincent Lauria- the untamed, passionate hotshot with an equally untamed bouffant. His pride can’t compensate for his naiveté, making him the perfect foil to Newman’s wizened, humbled old-time pool shark. While the film is framed as a battle of wits and will between these two men, THE COLOR OF MONEY sheds some light on interesting periphery characters, such as Carmen (Mastrantonio), Vincent’s street-smart girlfriend who we come to suspect might just be conning Vincent herself, or Helen Shaver as Jannelle, an aging cocktail waitress and Eddie’s on-again, off-again love interest. Notable characters actors John Turturro and Forest Whitaker make early career appearances in the film as a failed hustler protégé of Eddie’s and a small-time hustler who manages to con Eddie, respectively. 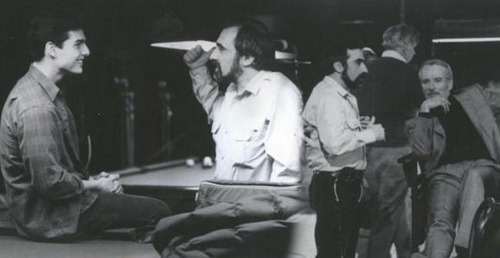 Scorsese’s tendency to appear in his own films also manifests here in the form of a voiceover during the opening credits whereby he explains the game of Nine-Ball—a variant on classic pool that the characters play almost exclusively throughout the film. Scorsese reunites with cinematographer Michael Ballhaus to create a look that is, admittedly, not very appealing. The entire 35mm film image is awash in a drab, grey color palette that evokes the cold winters of the Midwest as well as the cigarette haze of cave-like dive bars. Scorsese and Ballhaus counter this unappealing look with delirious camerawork and dynamic compositions. There’s an unrelenting sense of energy, with the camera constantly whip-panning to new tableaus, or screaming forward with a rack zoom onto pool balls scattered around the table. Indeed, Scorsese’s expressionistic rendering of the game of pool (artfully strung together by longtime editor Thelma Schoonmaker) takes a similar approach to the dreamlike boxing sequences in his other big sports film, RAGING BULL. Whereas RAGING BULL tended to emphasize the increasingly diminutive size of boxer Jake La Motta in contrast to his opponent or the ring itself, THE COLOR OF MONEYtakes the opposite approach: distorting the pool balls into titanic spheres tumbling around a tiny arena. The Band frontman and music supervisor Robbie Robertson once again collaborates with Scorsese, generating a bluesy score as well as sourcing an eclectic mix of needledrops like rock, blues, opera, and jazz. The effect is an energy that’s much more breathless and lively than a film about pool could ever reasonably hope to have. Despite THE COLOR OF MONEY ostentatiously being a work-for-hire, Scorsese seizes the opportunity to stamp his distinct imprint on the material. As a result, the film falls right in line with Scorsese’s other examinations of dishonest men as protagonists, as well as the particular brand of conflict that arises from masculine pride and posturing. Of course, this being a Scorsese film, the violence is messy, chaotic and unpredictable. THE COLOR OF MONEY’s third act concerns Eddie reawakening his talents at pool and mounting a comeback, ending with his victorious proclamation that whether he wins or loses, “I’m back!”. The same sentiment can said of Scorsese, who was able to mount something of a comeback himself– thus pulling out of the funk that had hung over his work for nearly a decade. The film’s modest success and Oscar win for Newman was enough to re-establish Scorsese’s viability as a commercial filmmaker, paving the way for a new act in his career that would not only see his longtime passion project, THE LAST TEMPTATION OF CHRIST, finally realized, but his prestige and importance to the world cinema stage grow exponentially. THE COLOR OF MONEY is currently available on high definition Blu Ray via Touchstone Entertainment.